Seriously – we had 10 burned out light bulbs in our house. We have this chandelier in our entry that is just a tad too high for B or me to reach to replace the bulbs (I’m 5’7, he’s 5’8) – and we didn’t have a stable enough ladder to get to them. Our step stool is not tall enough because the light is mounted on a vaulted ceiling. We would con my dad into replacing a bulb or two whenever he’d be in town (he is tall enough to use the step-ladder). The bulbs that came with the house were total and complete crap, so they were burning out left and right. We would just get done having my dad replace a couple, and then another one or two would burn out. It was driving us nuts – but not nuts enough to go buy an expensive extension ladder to replace them ourselves. This morning, there were 5 bulbs burned out in that thing – and only 4 remained lit! Then there are the recessed canned lights in the kitchen. Over a year ago, I decided to replace a bulb while B was out of town. We have one of those super long extension rods with special light bulb attachments. I used the nifty spring-loaded one and when doing it, I ripped the can right out of the ceiling. Our ceiling is 16 feet high, so you can imagine how easy that was to fix. We didn’t even try to con anyone to come over to fix that for us. We were going to have a handy man come out to fix it, but never got around to it. Of course, every time my dad was in town, he’d mention it and tell us to fix it. (Why do dads always feel compelled to tell us what we need to do, according to them?) Another canned light burned out in the kitchen last week – so we had two to replace and one can to fix. Then there is the light at the bottom of the stairs in the basement that burned out last week, that B didn’t even know existed! And finally, there are a couple canned lights in the basement that were burned out that neither of us noticed. I only noticed them when the previously mentioned light burned out. Neither of us spends too much time in the basement (cat-related) so they truly went unnoticed by us both. Today, we bought that super fancy, expensive extension/step ladder. You know the one – it’s like the Little Giant but cheaper. What’s really stupid about this story is that the ladder isn’t that expensive – it was just expensive enough that we’d rather spend the money on a new suit, or clothes for Matthew, or eating out. In a matter of 60 minutes, the ceiling canned light was FIXED, all bulbs were replaced with CFL’s (so they should last longer but we’ll see – they also advertise that they’ll each save us $44 a year in energy bills – yeah right! ), and my mood was completely elevated. I HATE burned out light bulbs. I cannot stand them. I am one of those people who will get depressed when it’s dreary outside, so you can only imagine what I’m like when my house is dimly lit ALL THE TIME. I walk around the house in complete awe of how beautifully bright it is. I am so happy! I honestly think that the bulbs being burned out can explain about 90% of my rotten mood when I’m irritable. There are still 3 bulbs to replace in the bedroom, but we got the wrong size. We didn’t even know that there were 3 lights in that fixture until the last one burned out this past week. I wonder if the two bulbs have been burned out since we bought the house. I can’t wait to see how bright the room is tomorrow when I get those replaced! It’s time to do a food update! As B and I get further and further down the paleo/primal road, we’ve been trying to introduce Matthew to more and more of our foods. We are not in agreement as to how big a piece of food is too big 😉 but we are in agreement on what Matthew needs to be trying. For instance, we went to Texas Road.house today and both of us were feeding him our ribs, broccoli, and green beans. Matthew and I went to Chick Fil A (how do you really spell that place?) very impromptu on Thursday after his gymnastics class. I had no food for him. Not a problem. He ate grilled nuggets, applesauce (a little too sugary for our taste, but what are you going to do? ), and yogurt. Success! It’s nice that it’s gotten to the point where we can make unplanned stops for food and still be able to feed the boy! Carrots -STILL loves, loves, LOVES carrots! Avocado – Did not like it, but we’ll try it again because I really want him to like it (I don’t like avocados and I know I’m missing out!) LOVES avocados now – especially when I spice it up with lots of cumin! Split pea stew – HATED it (and I don’t like the word, ‘hate,’ but that’s the only way to describe his reaction)! We will try it again later in the week I am happy to report that he gobbles this up plain or mixed with apples or any meat. YAY! Roasted red pepper and goat cheese puree – The first time I made this – both B and I were so jealous that we devised our own adult version of it for us. We all love this! BBQ ribs – He liked these just fine! Raw pears – if ripe enough, he loves them! I am pleased to say that Matthew has still never had a “puff” or cheer.ios. He is now entirely gluten-free since eliminating oatmeal from his diet. Categories: Food, Matthew | Permalink. Good news #1: I stopped up at the NICU today to deliver a gift to my friends. I wasn’t going to stay, and wasn’t even going to bother them to say, “hello.” I just wanted to drop off my gift at the front desk and be on my way – and out of their hair. The nurses kept insisting that I see “her,” and by “her,” I think they meant the baby. I kept saying, “no, no, I don’t want to be a bother.” They would not take my gift and picked up the phone to start dialing their room! I was just appalled! The last thing I wanted was to bother these poor parents when anything could be happening at that moment, good or bad. I sighed and turned my head, and there they were in the room right next to me. I told the nurse to stop dialing, that they were right there and then I asked, “is that their room? I can’t go in their room.” I was explaining to B tonight that I just don’t want to be that person who parades in to see their little baby. She’s their baby, not a spectacle. I don’t want them to feel like they need to explain a single thing to me about what’s going on with her, what the tubes are for, etc. I want her room to remain quiet and still – and I am not a quiet person even if I try. It turns out that the room they were in was just the family waiting room, and I was happy to go in there! So I did – and I am so glad I did! We chatted and it was really great to see them. There were tears exchanged but the good news is that they keep getting good news! This baby is unbelievable – and is on very little breathing support and has no bleeding on the brain. The one thing that isn’t going perfectly is the hole in her heart and she has surgery for that tomorrow – so please keep her in your thoughts and prayers. The surgery is routine, but as I said to my friend, as routine as it is, this is their baby and of course it’s worrisome. I didn’t stay too long, but you could tell that they would have been fine if I’d stayed a while. I think the visit was a nice, welcome distraction. I got a very nice text message later from one of them and I think I’m going to take lunch to her this week. I am so glad I stopped up and SAW them! Those nurses know what they’re doing! Good news #2: Matthew is consistently sleeping through the night! I mean – THROUGH.THE.NIGHT! He goes to sleep between 8 and 9 and sleeps until 6 – every single day! He even had a rough bedtime last night and I thought that it could be a rough night for us all but no – he slept until 5:56! Of course I brought him into bed with us and he slept with me WAY TOO LATE until 8:30. He wakes up crying from his night-time sleep. I think that has to mean he’s not getting enough sleep. We put him down tonight at 8:07 and I’m curious to see how he wakes up tomorrow. Anyway – that is FIVE nights in a row of continuous sleep! Good news #3: Paleo/Primal lifestyle is going well! I did try some things this week because my milk supply was pretty low when I pumped at the end of the first week of the diet. It got progressively less and less each night. I dabbled with limited grains and dairy this week and the supply went up – but it was also up on the days that I had no grains or dairy. I think the milk supply drop was a fluke. I’m back fully on primal/paleo which means gluten/grain/dairy free. I only lost one pound this week. For the two weeks combined, I’m at 5.6 pounds lost so far. Good news #4: Matthew fed himself for the first time tonight! Yes – I know – this is late in the game. However, when you don’t feed your baby puffs or cheerios, they’re very limited on what they can really pick up and get to their mouth without mashing it all up. 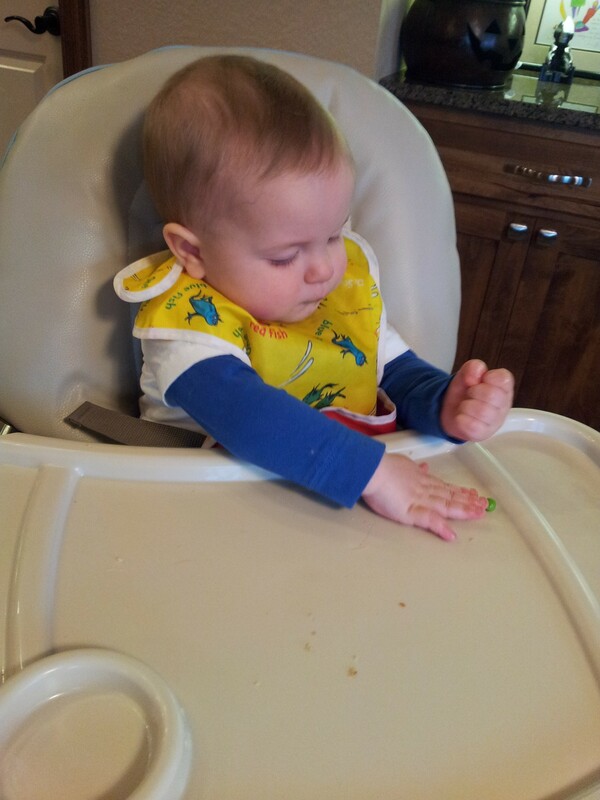 He tried really really hard with peas tonight and got one pea into his mouth successfully! Now that I’ve seen him do it, we can go back to me feeding him and keeping him clean. HA! Good news #5: Matthew has learned how to get himself down from standing positions all over the house. WHAT A RELIEF! This started yesterday and it could not be any cuter. He does not lower himself with his knees. No. He very carefully holds onto his support (me, a table, the sofa, whatever) as he steadies and lowers his tush a little. Then he lets go with both hands and falls on his tush. It is adorable! Of course we cheer him on over and over again! He stands up at his table just to plop himself back town again for practice/show. He has not pulled himself up in his crib all week so I’m not sure if he can do it in the crib or not. I have to believe he can and will if he does it everywhere else! Good news #6: I am making progress on Matthew’s birthday banner. It is getting out of control. Had I stuck to my original plan, I would have been done by now. Good news #7: I am working on planning my friend’s baby shower. Nothing makes me happier than planning a party! I am now planning TWO parties (birthday and shower) – so I am really excited! Good news #8: Now that naps are back on in the crib, I have been able to do my hair EVERY day this past week. AHHHH!!! It feels so good! Categories: Matthew, My Free Time, Sleep | Permalink. I am going to make this quick. I have a favor to ask. I’m not the most religious of folks. Spiritual? Yes. Religious? No. But someone I know needs positive thoughts and prayers. Friends of ours delivered their baby daughter on Monday at 25 weeks gestation. She’s tiny (1.38 pounds, 12 inches) and precious and seemingly doing well – but positive thoughts and prayers (if you’re of the praying persuasion) can’t do anything but help the situation. If you can just send up a quick happy thought or prayer for “Baby Laura,” it would be so appreciated! I told B today that I spend about 90% of my time right now thinking of my friends and their daughter. Every little thing that Matthew does makes me think of the struggle that they’re going through at that very moment. I have a knot in my stomach just thinking of what they’re all going through and the fight they have ahead of them. I think Matthew is reading my blog after I go to bed. I think he read that we were starting over with the Ferber method last night and decided that he doesn’t want to do that. He slept 9 hours! He did a lot of moaning around 3:00 when he usually wakes up, and he was sideways in his crib so I went in to straighten him out so that his head wasn’t up against the rails. That seemed to quiet the moans until 4:15 when he just quirmed a little. At 5:13 – he woke up for good and stood up, despite being in his sleep sack. I couldn’t get him to go back to sleep, and Ferber says not to try after 5:00, so I pulled him into bed with us and we snuggled until 7:30. I know, I know – snuggling in bed is not part of the deal but he was so tired still, and I saw no reason to torture him with being up so early. He took a long nap this morning (I forgot to write down the start and end time but it was at least 90 minutes and I think closer to 2 hours) and he did most of it in his crib. I nursed him to sleep and tried laying him down twice and he wasn’t having it. After 30 minutes or so, he went down just fine. He slept for an hour in the car at 3:15 because people were at the house at nap time so we took his nap time to the car. He went to sleep tonight right at 8:30 – on the nose. A good night, turned into a good day, turned into a good evening. I am not even thinking that this is a turning point… but golly, it sure would be nice! In other news, I was feeling bold today and posted a link to Jjiraffe’s recent blog post on FB. I have 4 “likes” so far – two from other infertile friends and two from a couple of dear, fertile friends. I don’t know where this bravery is coming from, but I think it’s a good thing. One of my infertile friends, who is fiercely private, reposted the link on her FB page/timeline. I was very proud of her – that alone made my posting of the link so worth the agony over whether or not to do it! In more other news, I finally figured out how to use my Cricut die-cutting machine yesterday – so I am full-on working on Matthew’s birthday banner. I’ve had the machine for a year (a gift from my mom) but was terribly intimidated by it. My sister, who has a wonderful (and successful!) Etsy store, gave me a crash course on using it and it is rather easy! Matthew’s birthday banner is getting more and more ornate by the day. Next up will be practice cakes so that I can get his birthday cake just perfect! Before any of you think I’m this crazy cake chef – I am not. I use boxed cake and then do all the decorating with fondant and homemade frosting. I only have two months to work on the cake and that is now intimidating me. A very quick update because I’m tired. It dawned on me from the comments I’ve received about Matthew’s sleeping that I have not shared the latest. We’re starting over with Day 1 of Ferber tonight. He slept that one night of 10.25 hours (who’s counting?) and then it went downhill from there. I have pulled out the old sleep sacks to try to keep him from standing up in his crib (he figured that out though today during his second nap – I’m hoping he’ll be too tired in the middle of the night to push his luck and balance). I have started a new tracking spreadsheet (as if that has anything to do with it). I’ve re-jazzed myself for those long nightly stretches of going in every X minutes to try to calm him down. I wanted to update you because letting you all think that this whole thing is working out, is operating under false pretenses.